Signed, Sealed, and Undelivered is a collaborative international project that brings together scientists and humanities scholars whose expertise ranges across history, languages, material studies, conservation, curation, artificial intelligence, imaging, and engineering. It explores a truly unique archive of letters: the Brienne Collection held at the Museum voor Communicatie in The Hague. The collection is made up of a postmaster’s trunk containing around 2,600 letters sent from all over Europe to The Hague between 1689 and 1706, none of which was ever delivered; 600 of these letters have never been opened. The project was established formally in 2015, when the group was awarded an Added Value through Humanities Grant by the Netherlands Organisation for Scientific Research [NWO]. The project’s aim is to preserve, digitize, transcribe, and edit the Brienne Collection for future scholarship. The project will also attempt to ‘read’ the unopened letters without breaking their seals. To this end, Signed, Sealed, and Undelivered has forged a partnership with Graham Davis and David Mills of APOCALYPTO at Queen Mary University of London [QMUL], pioneers in the field of x-ray microtomography, which will be used to read the trunk’s 600 unopened letters. The project team is working closely with the Unlocking History group which includes collaborators at MIT’s Center for Bits and Atoms, the Computer Science and Artificial Intelligence Laboratory, the Department of Material Science and Engineering, and the Wunsch Conservation Laboratory. The entire endeavour is based on close co-operation with Koos Havelaar, Curator of Postal History at the Museum voor Communicatie. Metadata for the Brienne letters were supplied to EMLO by the Signed, Sealed, and Undelivered project team: Rebekah Ahrendt (Utrecht University), Nadine Akkerman (Leiden University), Jana Dambrogio (MIT), Daniel Starza Smith (King’s College London), and David van der Linden (University of Groningen). The project was funded by two grants from the Netherlands Organisation for Scientific Research [NWO]: Added Value in the Humanities (2016–17) and Internationalisation in the Humanities (2016–19). The Seaver Institute generously funded the development of letterlocking terminology. Cultures of Knowledge facilitated the editing and publication of this catalogue through a significant investment of time and expertise, and has adapted the structure of EMLO to accommodate additional fields required by the Brienne metadata. Signed, Sealed, and Undelivered, together with the Cultures of Knowledge project, would like to thank Metamorfoze — the Dutch national programme for the preservation of paper heritage — for funding the digitization of the Brienne collection, MIT Libraries for funding initial research to identify letterlocking formats, and both Linda Brakenhoff and Geeske Bisschop for transferring and translating metadata from the museum catalogue. Signed, Sealed, and Undelivered project website. In 1926, the Museum voor Communicatie in The Hague acquired a seventeenth-century trunk of letters. 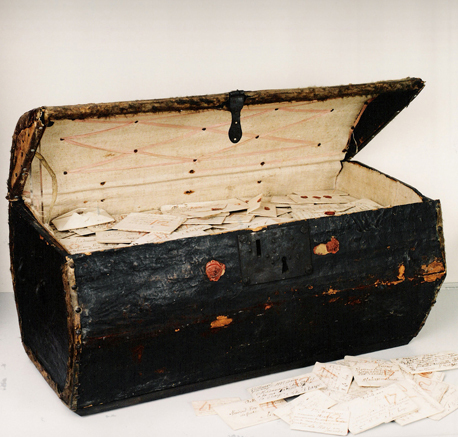 The trunk once belonged to postmaster Simon de Brienne (born Simon de Veillaume) and his wife, postmistress Marie Germain, a couple at the heart of Europe’s early modern communication networks. It contains an extraordinary archive, now known as the Brienne Collection: an estimated 2,600 letters sent to The Hague between 1689 and 1706. None of these letters was ever delivered to their intended recipient and, in fact, 600 of them still remain unopened. The vast majority of the letters originate in France, as Brienne and Germain were jointly responsible for delivering all mail from the French kingdom to The Hague, but the collection also includes a number of letters from regions that fell within their wider remit, in particular Flanders, Brabant, and Geneva. As a result, most letters are in French, although the Brienne Collection contains a small number of letters written in English, Dutch, Latin, Spanish, Italian, and Danish. Why were the letters never delivered? A major obstacle before the invention of postage stamps is that recipients — and not senders – were responsible for postal and delivery charges. But if the addressee were deceased or absent, or rejected the letter, no fees could be collected by the postmaster. The letters in the Brienne Collection still bear witness to this simple fact: many have scribbled on them in Dutch ​niet hebben (‘refused’). Additionally, a number of letters ended up in The Hague only accidentally. Addressed to ‘La Haye en Tourraine’ or ‘La Haye en Flandre’, these letters were mistakenly bundled with those for ‘La Haye en Hollande’ by the French postal services. Others did not have The Hague as a final destination, but were addressed to London, Copenhagen, Berlin, Frankfurt, Warsaw, Hamburg, Stockholm, and other European cities. Although postmasters usually destroyed such ‘dead letters’, the Briennes preserved them, perhaps in the hope that someone would retrieve the letters — and pay the postage. Tellingly, their nickname for the trunk was ‘the piggy bank’ (Dutch: spaarpotje). The Brienne Collection freezes a moment in time, allowing us to glimpse the early modern world as it went about its daily business. The letters represent the thoughts, cares, and dreams of a cross-section of society: there are missives by ambassadors, dukes and duchesses, merchants, publishers, and spies, but also by actors and musicians, ordinary lovers, struggling refugees, and by women as well as men. The Brienne Collection will be especially useful therefore to researchers studying the letter-writing practices of social classes beyond the elites, and for exploring the transnational links between early modern France and the Dutch Republic. A distinctive aspect of this project is that it seeks to preserve, record, and analyse the material features of the letters found in the Brienne Collection, especially the folding patterns and closing techniques that built varying levels of security into these letters. Because the letters have been stored folded and have never been repaired, they offer researchers a unique opportunity to investigate ‘letterlocking’, the art of folding and securing an epistolary writing substrate — such as paper — to function as its own envelope or sending device. The Brienne Collection’s letters have been folded in a variety of intricate forms, and the Signed, Sealed, and Undelivered project will incorporate this information into the EMLO catalogue by developing a new set of metadata standards. All letters in the Brienne Collection have been imaged by Art in Print at the Zeeuws Archief in Middelburg, the Netherlands. Digitization was financed by Metamorfoze, the Dutch national program for the preservation of paper heritage. Please note that the images provided in the EMLO catalogue are in lower resolution due to data-storage limits. The number of 2,600 letters kept in the Brienne Collection is an estimate. Because many letters contain further enclosed letters that need to be catalogued separately, the total number is likely to increase as the process of cataloguing advances. The first records comprise a selection and further records will be added incrementally to EMLO. The Brienne Collection as a whole is catalogued by the Museum voor Communicatie as ‘I 46’. Letters within the collection are marked ‘DB’ (an abbreviation of ‘De Brienne’), followed by a unique four-digit number. Hence, a full inventory number would be ‘I 46:DB-XXXX’, but in the EMLO catalogue this has been abbreviated to ‘DB-XXXX’. A complication is that enclosed letters have not been numbered hitherto; the SSU team has decided to identify these by adding a hyphen and a numeral. For example, letter DB-0041 has three enclosed letters: the main letter is numbered DB-0041-1, the enclosed letters respectively DB-0041-2, DB-0041-3, and DB-0041-4. The added numerals do not necessarily reflect the original intended order of the enclosures. Ideally, we like to re-establish the proper order of enclosures, but this work remains to be done. When citing letters from this collection, please use the following format: Museum voor Communicatie [MvC], The Hague, the Netherlands, Brienne Collection, DB-XXXX. The catalogue also lists the letterlocking format and category of each letter. Format refers to the geometrical shape of the address panel of a folded letter. The formats present in the Brienne Collection have been abbreviated as follows: 4RW=4 edges, Rectangle Wide; 4RXW=Rectangle Extra Wide; 4RT=Rectangle Tall; 4RD=Rectangle Diamond; 4S=Square; 4SD=Square Diamond; 4A=Asymmetrical; and 5A=5 edges, Pentagon Asymmetrical. Category on the other hand refers to the series of physical manipulations that were performed to turn a sheet of paper into a folded letter. The manipulations present in the Brienne Collection are: Fold, Tuck, Adhere, Slit/hole, and Lock-N. For more information on these letterlocking formats and categories, please visit the letterlocking website. Ahrendt, Rebekah, and David van der Linden, ‘The Postmasters’ Piggy Bank: Experiencing the Accidental Archive’, French Historical Studies, 40, no. 2 (2017), pp. 189–213. 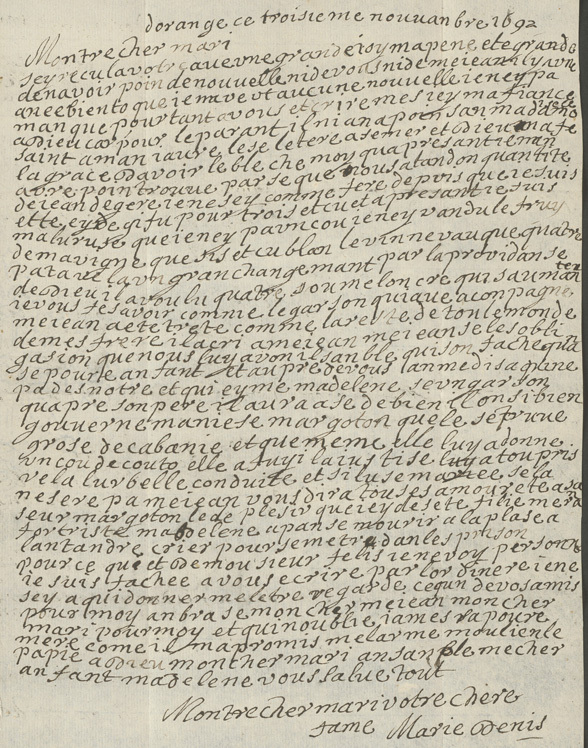 Giphart, J., ‘Lettres et estampilles européennes des années 1689 à 1706 faisant partie de la collection du Musée Postal des Pays-Bas’, Schweizer Briefmarken-Zeitung, 66, no. 6 (1952), pp. 147–51. Giphart, J., ‘Postmerk en Postgeschiedenis’, Jaarverslag Nederlands Postmuseum, 31 (1961), pp. 18–36. Graswinckel, D. P. M., ‘Simon de Brienne’, ​Jaarboek Die Haghe (1944), pp. 5–33. Online videos of the major letterlocking patterns found in the Brienne Collection may be found here. For more information on letterlocking and the forthcoming Dictionary of Letterlocking (forthcoming 2017), please visit the letterlocking website.